How to make money selling Chocolates? How to make money selling chocolates? That’s the 64 thousand dollar question that everyone who wants to open a chocolate shop or chocolate counter asks themselves, or at least should do before they embark on the venture! This article could be sub-titled… Why you should consider a fresh chocolate counter. Why do People buy chocolate? Who are my customers and what is my unique selling point? People typically buy chocolate for two reasons; a self indulgence treat or as a gift. There are also home bakers and chocolate makers but we won’t consider those here. Gifting occurs all year round for Birthdays and thank yous and you will hope to build a regular customer base for these occasions as well as from passing trade. In the UK seasonal chocolate gifting is centered around the peak holiday seasons of Christmas, Easter and to a lesser extent Valentines and Mothers’ Day. Halloween is growing in the UK though still very much at the low price point novelty end of the market. End of term thank you gifts for Teachers is also an area of growth and you shouldn’t forget local businesses. However like many retail businesses Christmas is the most important gifting time closely followed by Easter. Christmas sales can make or break a retail business! In chocolate terms you will almost certainly see two large peaks in your sales at Christmas and Easter and these will raise the bar for your average sales if you hit them correctly. Easter Saturday can be almost equivalent to the whole of January in pure chocolate sales! Fortunately chocolate is a fantastic gift for these occasions and your objective is to present your potential customers with a unique gift. A proposition that is different from the supermarket and one that shows your customer has put some thought in selecting his gift hence the reason for seeking you out. Self indulgent purchases can range from a weekly chocolate treat for regular customers to a welcome distraction for browsing tourists. 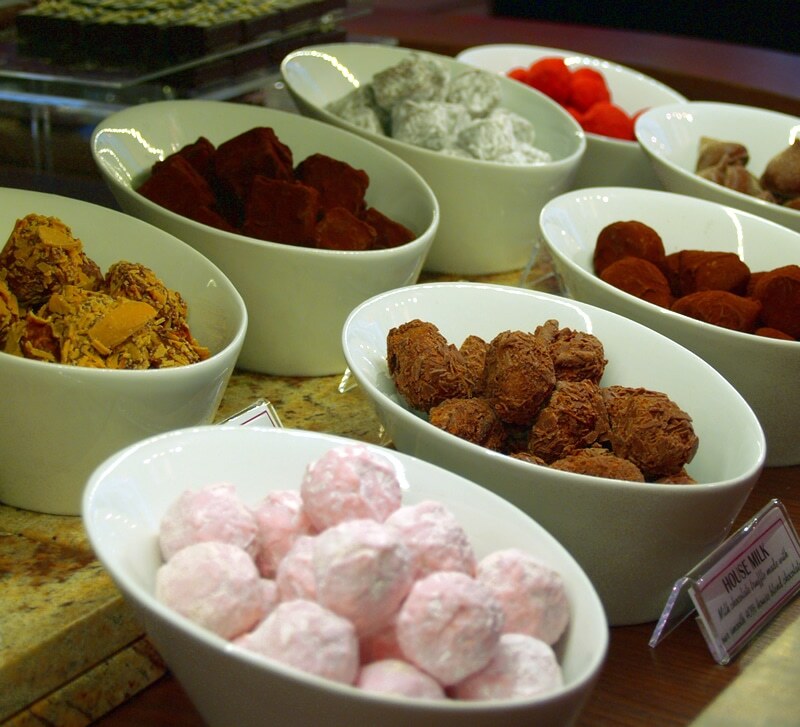 All chocolate shops can benefit from being in a touristic area and it should be an important part of your sales strategy if you are in a touristic location. What chocolates should I sell? The chocolates that you sell can broadly be divided into two categories – pre-packaged items and pick your own loose chocolates. Perhaps surprisingly a pick your own chocolate counter can offer higher margin and more profitable sales compared with pre-packaged items for both gifting and self indulgent purchases. It also presents an important point of difference with regards to retail theatre. But why is this? When you buy a chocolate product to sell you are paying the producer for ingredients, time to make, packaging, and time to pack. The producer then adds a suitable gross profit margin on top of these costs to create a wholesale selling price. You as the retailer then add your markup or margin to create your retail selling price. If you price your goods correctly you will sell enough to cover your overheads such as staff costs and make your own profit!. Great you say! So how do I go about setting up a fresh chocolate counter? Where do I buy packaging, how do I display the chocolates? Do I need a refrigerated counter? What about stock rotation? Where do I buy Chocolate Packaging? There are several companies who supply chocolate packaging and we are happy to recommend these to wholesale customers for our fresh chocolates. Most of them have off the shelf packaging which can be purchased online in small order quantities (e.g. packs of 25) and then customised with your own branding via printed stickers, tags etc which can be purchased from your local printer. Some packaging companies have personalised box options from as little as 100 boxes. For self indulgence clear bags are perfect and customers love to choose a selection of chocolates by weight. Perfect for meandering tourists and the packaging costs are minimal so customers feel that they are getting more for their money which is of course true so long as you price it that way! Now, if you are a really smart retailer you can arrange a chocolate counter such that the packaging is at the start of the customer’s journey around your counter, the till and scales being at the other end. This is how we organised the counter in our own chocolate shop. So if your customer wants to buy a box of chocolates as a gift they can select an empty box of the size and price they want and walk along selecting chocolates of thei r choice. This is terrific retail theatre particularly if you keep your display well managed. It is well know that people buy food with their eyes and a beautifully presented counter will increase your sales. Producers of pre-packaged goods (includng ourselves) often go to great lengths to make a display window to allow you to see your product. Here you have no such barriers. Have a selection of tongs or white chocolatiers gloves at the ready if you need to help and your customers can make their own selection. We proved this point ourselves when we redesigned our chocolate counter range to present truffles in bowls and square cut and domed ganaches in a more couture style. Our sales increased significantly in a very short space of time and our counter looked so good we were even chosen as a film location for national television. The customer is selecting a unique gift, one which they have put together themselves. Almost all chocolate shops will have some free time early in the morning or between customers and this is the perfect time to replenish the counter and make more boxes for your box display. Thus you are using your own spare time or your staff’s time instead of paying the manufacturer’s staff to put together packaging for pre-packaged goods. But don’t I need a refrigerated counter? Not at all! It’s a myth that you need to keep chocolates refrigerated. We had terrible problems with one large retailer who put our chocolates right at the bottom of a refrigerated display cabinet set to 5 degrees C (don’t do this). It created a huge amount of condensation that made all of the chocolates wet! An ambient temperature of 17 degrees C is ideal. Keep your display away from direct sunlight as that Indiana Jones ray of sun can melt chocolates in front of your eyes! If it’s a new shop and you are carrying a fit out we recommend air conditioning the whole chocolate room. This is more cost effective and flexible than chilled counters and will allow you to keep stock safely through the summer. Many retailers set up display vases that look elegant, add multiple display levels and are inexpensive to purchase. Marble or granite slabs are also a good medium to display chocolates on due to their temperature stability. So if you can try the concept of fresh chocolates without a large outlay you can always reverse the decision! You will want to set up your counter such that it is clearly an area to purchase chocolates (no those aren’t free tasters! ), not easily reachable by small children and not sneezed over! But what about shelf life and stock rotation? Chocolates made with a fresh cream ganache will have a shorter shelf life compared with pralines or fondant creams. However the taste of these chocolates is so different to long shelf life pre-packaged supermarket chocolate boxes that it will present you with a real point of difference. In our experience if you judge your stock levels well you will get little wastage and any that do get close to their best before date can be used as promotional tasters. 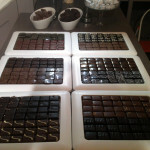 We make our wholesale loose chocolates to order such that you get the maximum possible shelf life. Stock rotation is crucial to this. A good technique we used is to display your chocolates on clear acrylic sheets in two levels, one on top of the other. 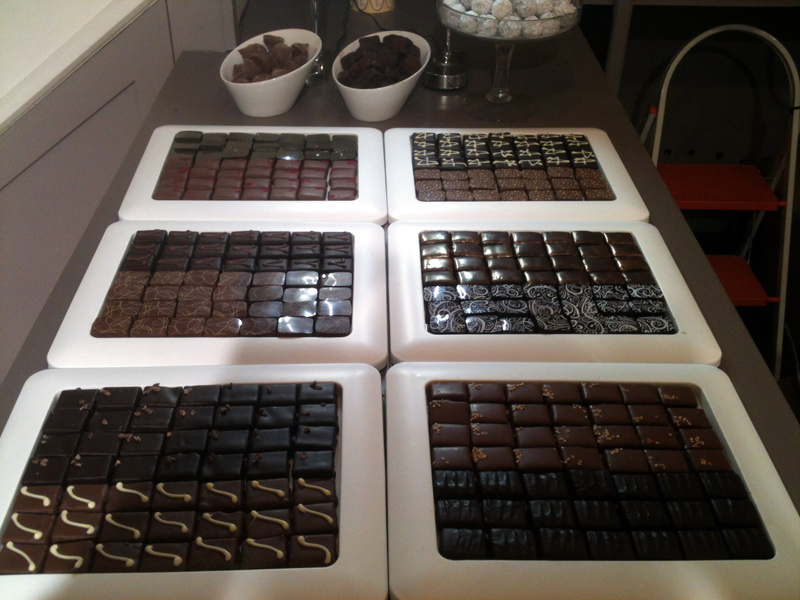 Always refill the lower level with the newest batch of chocolates and serve from the upper layer. If you keep your acrylic sheets clean and shiny your counter will always look full due to the optical illusion of the chocolates underneath! Create your own retail theatre! It makes good business sense of course to stock both pre-packaged chocolates along side your fresh chocolate counter. 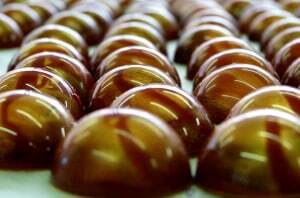 We have a full range of award winning fresh chocolates handmade by our small team and we will of course be delighted to supply you chocolates for your own chocolate counter! Now you can buy the book! This post has proven so popular over the last three years that we have now written a book of the same name “How to Make Money selling chocolates“. We boil ten years of experience and mistakes into one 173 page book that will tell you everything you need to know to start your own chocolate shop. From finding your shop, fitting it out, environmental health requirements, choosing your product mix, how to price your chocolates and a template business plan. This book is a must if you want to live the dream and open a chocolate shop or any retail shop. Available to buy directly from ourselves as a PDF download or from Amazon as a Kindle book or full colour Paperback. This entry was posted in Blog, Business, How to Make Chocolates, Wholesale Information and tagged business, how to make money selling chocolates.